Everyone loves out-of-sequence storytelling. Pulp Fiction, Arrival, and The Usual Suspects top the list of films that ignore the exact chronological order of events. Authors develop the narrative structure of these films the same way they do when working a more linear approach. While seemingly complex and unknowable, the path to a structure is clear: Know what it is you want to say with your story. Even for something as delightfully complex and sophisticated as Christopher Nolan’s Memento. I was reading around on the forums and periodically the distinction between storyforming and storytelling (or weaving) comes up in regards to the sequence of events. Would it be correct to say that from the standpoint of a storyform the events are always chronological? The storyform the writer refers to is the hidden code of the premise (previously referred to here as the Narrative Argument). Defined by the Dramatica theory of story, this code is a collection of seventy-five Storypoints that meld Character, Plot, Theme, and Genre into a single argument. Storyforming sits apart from Storytelling. The Storypoints of narrative structure and their specific Encoding—whether an Element of Avoid is about running away or about preventing another—are a part of the Storyforming process. How those specific encodings are presented is part of the Storytelling process. Storyweaving, a particular stage within Storytelling, is the process of laying those Storypoints down in preparation of delivery to the Audience. E - In 2019 at 3pm I valiantly get back up and chase down the burglar. Does this mean in all cases that from the Storyform’s standpoint the sequence is B-D-A-C-E? And the answer is yes. B-D-A-B-C convey the order of Storybeats within the storyform. The storyform represents the chronological order of events regardless of presentation. The storyform structures the Author’s premise. If B-D-A-C-E tells a complete story, then A-B-C-D-E represents the Storyweaving for that narrative. The premise, or Narrative Argument, is clear to the Audience If they can decipher this original order by the end of the story (consciously, or subconsciously). Can the Audience understand what it all meant, and what the Author was seeking to prove? Meaning determines the narrative structure. For the longest time, people thought stories were merely cultural myths—heroic journeys of personal and possibly spiritual transformation. These were written down and collected into a paradigm of narrative known as the Hero’s Journey. Eventually, there was even a Heroine’s Journey. In the early 2000s, mythos gave way to pattern matching with the introduction of the Save the Cat! paradigm. No longer tied to our old need for spiritual growth, Authors were free to concentrate on Dark Night of the Soul moments solely. The Bad Guys Closing In became just as important, if not more so, then Returning Home with an Elixir. Meaning became something repeatable—easily identified by what worked before in generations past. The Hero’s Journey and Save the Cat! suffer from the same indisputable deficiency: their framework is based on recognizing commonalities, rather than identifying the Author’s intent. Purpose requires an order of sequencing that supports that purpose. A story of Triumph demands a structure utterly different than a Tragedy. Enter the Dramatica theory of story. Dramatica looks to the Author’s intent first. By identifying the critical components of the premise, Dramatica supplies all the necessary information required to make that argument successfully. What is the actual Source of Conflict in the story? What are the various points-of-view engaged with this Problem? Were they right to alter their approach, or did it end in abject failure? With Dramatica—and my app built on the fundamental foundations of the theory, Subtext—Authors can now account for the meaning they want to convey to their Audience. The message is now part of the structure. So, does that mean the message behind Memento is one of confusion? No—but it does mean that Christopher Nolan used sophisticated editing techniques to amplify and support the narrative structure of that film. While tragic to the individual, you can devise a way to alleviate personal guilt by focusing on everything external to yourself. Probably not what you expected, but if you think back over the entire experience of watching Memento, you would be hard pressed to find a more accurate objective interpretation of the meaning behind the film’s events. Leonard succeeds by imagining a new John G.—someone else he can focus his compulsion for revenge upon. While personally tragic, this outward attention keeps the loop going. The complexity of this argument demands a unique set of dynamic Storypoints that eventually end in a Main Character Problem of Ability. The Main Character Problem is an Appreciation of narrative structure that focuses on the specific Element driving the central character forward into the story. A lack of Ability—or disability, in Leonard Shelby’s case, needs to be at the heart of what is driving the Main Character for Memento to communicate the above narrative argument or premise. Character is Theme. Theme is Plot. Plot is Character. The four pillars of a story all work together to convey a particular Narrative Argument. Once you understand the existence of a connection between argument and the particulars of the story, you begin to wonder which came first—the story or the argument? Both go hand-in-hand. One does not exist with the other. Balance in all things. Leonard’s disability, his short term memory loss, is both the story and the argument of Memento. Guilt is a state of mind. And while our minds eventually lead us to a place where we can forgive ourselves, the ego is strong. The only way to maintain that denial of personal accountability is to actively stay focused on the external—while keeping blind to the internal. Short term memory loss is more than an amusing story concept, then—it’s essential to the idea of the argument. Allowing the Audience to experience the act of staying blind to ourselves reinforces the message and drives home the sense of personal tragedy. The Main Character Throughline is not about a character—it’s about a perspective. For an argument to be successful, it needs to approach its message from all sides. You can’t merely argue one side of a debate in hopes that it maintain the test of further scrutiny. One side essential to explore within an argument is the personal point-of-view—the role and responsibility of the individual within the context of the narrative. This Main Character point-of-view brings the audience into the discussion. It allows them to become a part of the message by positioning them in that personal point of view. The experience becomes less a lecture and more an appreciation of the totality of the message. 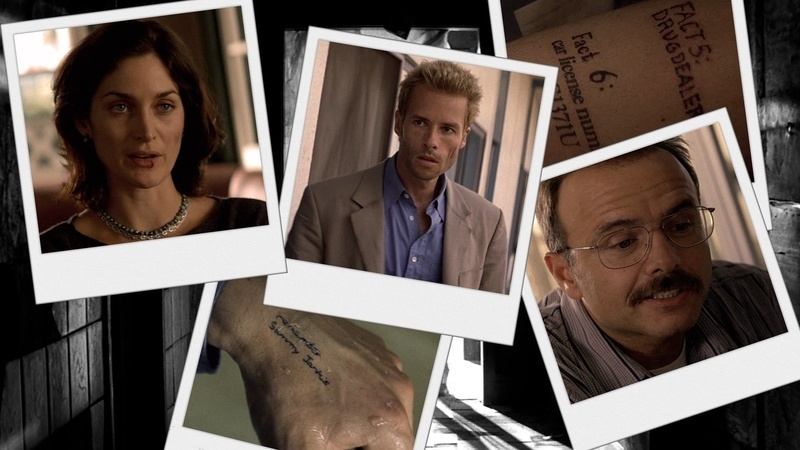 The complex and sophisticated Storyweaving found in Memento is more than a hook—its essential towards communicating Nolan’s argument. That sense of memory loss—of being able to forget and not being able to ignore—is woven tightly into the very fabric of the narrative. The mind naturally seeks meaning. It wants to unravel the threads of a story because the mind wants to appreciate the Author’s unique point-of-view. Knowing what that point-of-view is—what you’re actually saying and arguing with your story—then becomes paramount. That argument has a structure to it. That argument has a storyform. How it’s wrapped up and woven together for the Audience is an entirely different thing. The presentation is not the storyform. As we experience Memento and begin to unravel the individual threads, we begin to piece back together the original structure inherent in the narrative. We begin to understand where the Author Christopher Nolan is coming from and we have a better idea of how to alleviate our own feelings of guilt. Even if it means keeping ourselves blind to the truth. Blinding ourselves along the way.